Getting 'Banksied' Comes With A Price — And Maybe A Paycheck Last week, Cara Tabachnick got a text from her father: "Our building got Banksied and there's a crowd gathering outside. What do we do?" British graffiti artist Banksy chose their wall as a canvas. Now, the Tabachnicks are fending off vandals and facing big decisions. Cara Tabachnick's family owns the East Williamsburg building that Banksy chose as the canvas for one of his latest works. They installed a metal gate and commissioned a guard to protect the art from vandalism or removal. The elusive British graffiti artist Banksy has taken to the streets of New York this month, tagging buildings throughout the city. Last week we brought you the story of his fans, who have been on the hunt, early each day, to find his latest creation. They have to move quickly; Banksy creations are often vandalized after their locations become known. 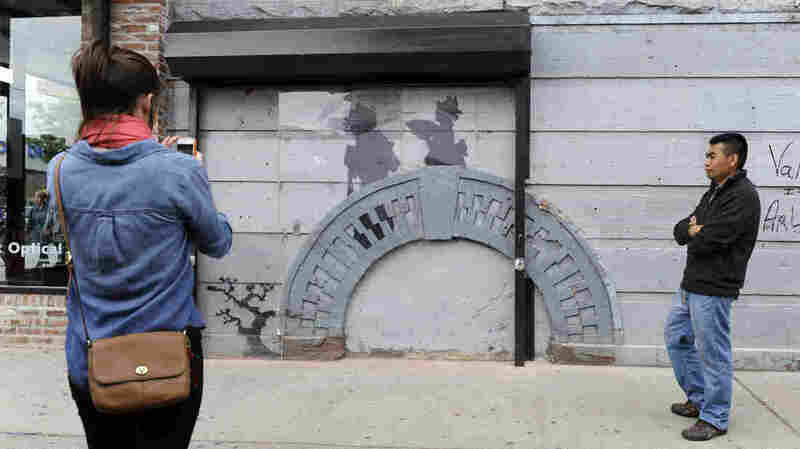 But in a city full of people searching for Banksy, a few lucky New Yorkers have found that Banksy comes to them. What happens when the artist, whose work has sold at auction for more than $1 million, chooses your address and your wall for his canvas? Last week, Banksy graffitied a building in the Brooklyn neighborhood of Williamsburg that's owned by Cara Tabachnick's family. 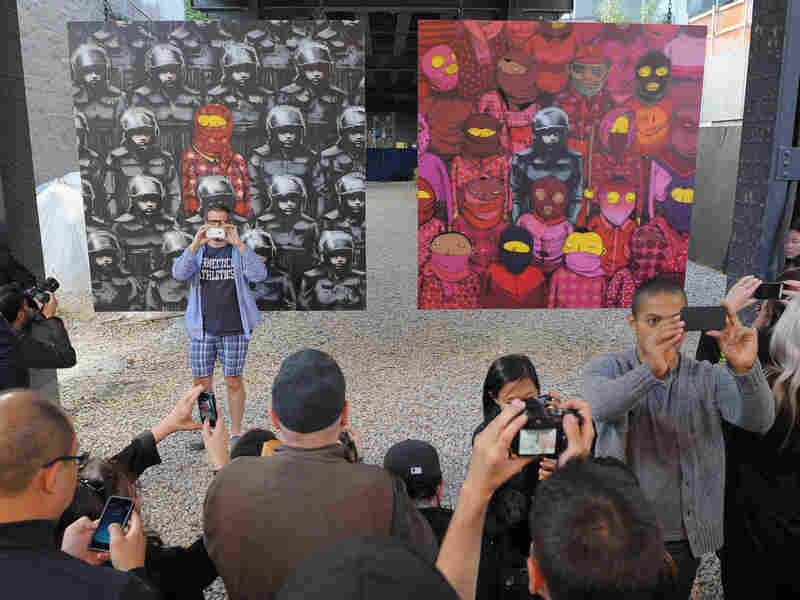 "I was actually screaming with excitement," Tabachnick tells NPR's Audie Cornish, "and my sister said, 'Who's Banksy?' "
Tabachnick talks to Cornish about life as an unexpected owner of a Banksy original, a vandal's attack, her family's improvised system of "viewing hours," and what they might do next. Crowds of locals and tourists alike have gathered to see Banksy's daily creations this month, which he has called a New York City residency. These pieces, unveiled on Oct. 18, hang in the Chelsea neighborhood of Manhattan. There's a covered window where the basement windows used to be, and it has a brick archway over it that resembles a bridge. And he had stenciled two sort of geishas walking over the bridge. One is holding an umbrella, and one is holding a fan. And in the bottom left there's a tree that spreads out that almost touches the women. It really is a beautiful piece, and they're stenciled through the brickwork, so it looks like they're on the bridge. Well, it all started with about 500 people gathering at the building on the morning the Banksy was painted, and a panicked text from my father, who has a business in the bottom of the building, saying, "Our building got Banksied and there's a crowd gathering outside. What do we do?" We're still figuring out what it means. Our first instinct was to protect it, and it still is our instinct. But we didn't understand or realize that of all the people that love and appreciate Banksy, there's another cohort of people that are out there to destroy him. And every day we are contending not only with people that come to look at the artwork, but people that are coming to try and destroy it. On the first day of the unveiling, if we can call it "unveiling," we had somebody come and spray-paint over the painting, and the crowd assembled and attacked the spray-painter and knocked him to the ground. And we were able to rescue the spray paint, because it happened so quickly, with alcohol swabs. We were able to take off the spray paint over the painting. But that sort of introduced us to the understanding that, wow, there's going to be a lot of people out here, and they're going to go to many, many lengths to try to destroy this painting. At the beginning, after the incident happened, when we first had the spray paint, my dad decided to hire a security guard to stand outside to help a little bit. We called the police, I mean, we didn't really know what to do, so we decided to just have somebody we knew from the neighborhood stand outside and try to control people from attacking the painting or the crowd. Then we had a regular roll-down garage metal gate put up on the wall, so it's only raised, I guess, for right now, for viewing hours ... at this point, I mean it's almost like its own little street-side museum. It leaves us in a sticky place ... he's putting artwork on our wall that now we're expected either to protect or let it be destroyed, and we can't sell it. And we don't necessarily want to sell it; we don't know yet. But I have been approached by a gallerist, and this is something that this gallery specializes in. They could come, take down the wall, put it up for auction ... and that could be the route that we go. It puts us in a conundrum, I mean, we believe — I think we truly believe — that this art is for the public. But we're also not equipped to serve the public's needs.